This "Historically Speaking" column was published in the Exeter News-Letter on Friday, November 7, 2014. Oliver Moulton Chadwick wasn’t born in Exeter, but his family had been here for generations and when he was killed in World War I, the people of Exeter felt the loss as if he had been one of their own. Scrapbooks of his life, donated by the family, are in the collections of the Exeter Historical Society. Chadwick was born in Lowell, Massachusetts, the only son of Austin Kilham Chadwick and Julia (Moulton) Chadwick. Austin Chadwick, born and raised in Exeter, had attended Phillips Exeter Academy and was president of the Lowell Five Cents Savings bank. Oliver’s boyhood was a happy one. He attended Lowell public schools before following the family tradition of entering Phillips Exeter Academy. As part of the class of 1907 he excelled at both athletics and academics, winning the Yale Cup upon graduation. His friend and eventual brother-in-law, Charles Parker Long, noted that he mastered any sport he took up primarily because he was in peak physical condition. His approach to academics was similar to his devotion to sports. He kept up – or ahead of – his courses at all times, graduating from Harvard in 1911 and Harvard Law School in 1914. By that year, of course, war was brewing in Europe. He entered the legal firm of Stone and Webster in Boston, but the pull of military duty nagged at him. The United States pledged to remain out of the European War. For the most part, public opinion agreed that the war was not our business. Oliver Chadwick, however, was eager to be involved viewing the conflict as a threat to democracy. He was troubled by a speech delivered by President Woodrow Wilson shortly after the sinking of the Lusitania in 1915, in which he justified non-intervention by stating: “There is such a thing as a man being too proud to fight. There is such a thing as a nation being so right that it does not need to convince others by force that it is right.” To Chadwick, such a statement was fraught with arrogance. He tried to enlist in Canada, but was rejected numerous times because he was an American. He joined the National Guard to get some military training and found himself sent to the Mexican border for four months. On his return, he enrolled in the Curtiss Flying School in Newport News, Virginia, easily mastering the shaky new technology. As soon as he felt comfortable in the air, he set sail for France. He arrived in Paris in January of 1917, as the United States was seriously pondering entering the war. Chadwick didn’t want to wait. He donated money to the French cause, commenting: “it gives great pleasure to the soldiers, that I have seen, and it does something toward wiping out the stigma of being a people who are too proud to fight, even when civilization is at stake.” He eagerly joined the Service Aeronautique and began training at various airfields in France. By July, he had become an accomplished pilot and was assigned to SPAD 73, becoming part of the Lafayette Escadrille. The airmen in this corps were Americans volunteers. They were young, well-educated and fearless. Chadwick wrote that their duties were primarily, “attack and defend. Attack enemy machines and balloons and defend our own, also defend our position from spying eyes.” The lifespan of pilots in World War I tended to be short – averaging under 100 hours flight time. The airplanes were lightweight and unreliable. Dogfights between pilots were common. On August 14, 1917 – only a month after completing training – Chadwick volunteered to fly a patrol and when his British comrades were threatened by German planes, he broke formation and started to go after them. He was shot down from behind and his plane plunged into no man’s land below. 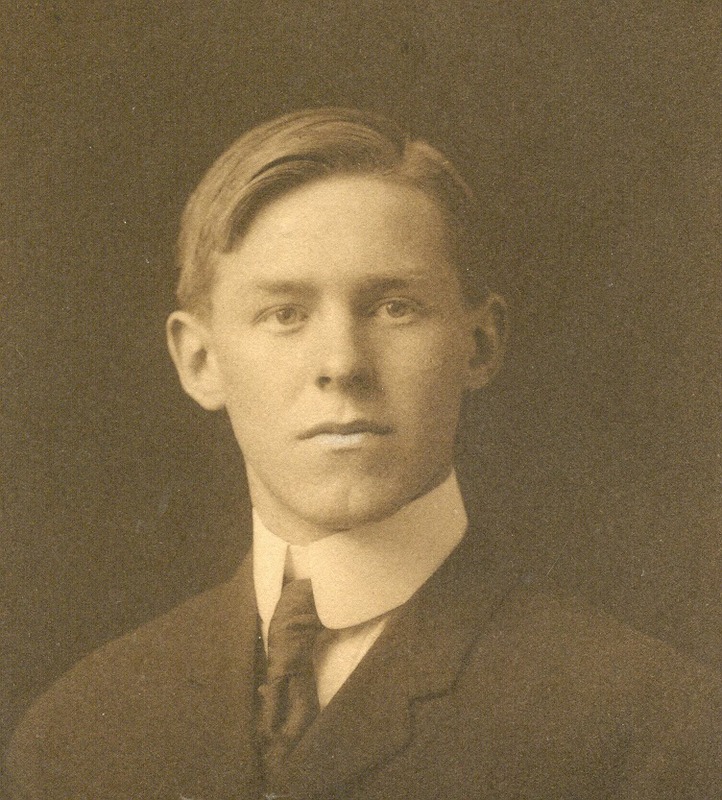 Images: Oliver Moulton Chadwick, seen here in his 1907 Phillips Exeter Academy graduation photo, was eager to participate in the First World War. He volunteered for service in France before the United States was formally involved in the war, joining the Lafayette Escadrille. 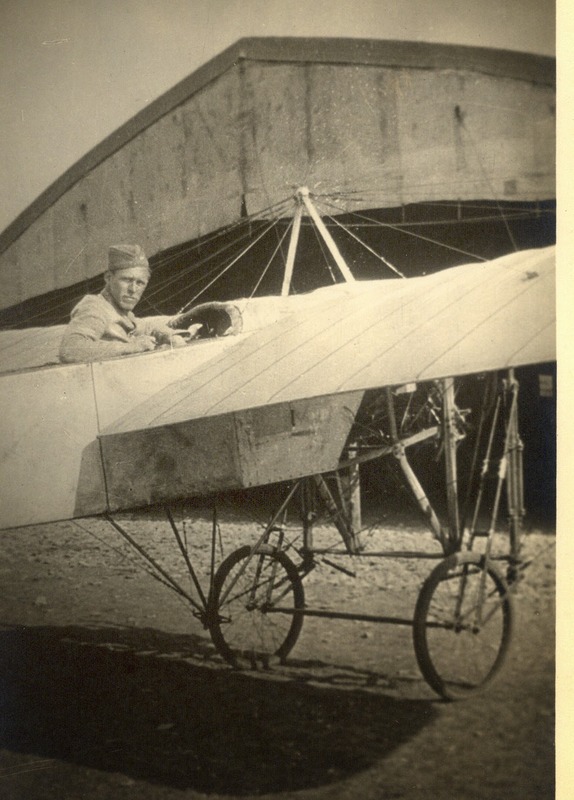 In the next image he is shown training in France in a Bleriot aircraft, which was slightly more fragile than the SPAD XII he would eventually fly in combat.